Dr. Rodney B. Thomas, Jr.
Dr. Thomas is dedicated to helping people live a more fulfilling life without pain and disease. His passion is to help people virtually never be sick. Dr. Rodney B. Thomas, Jr., founder of Access Family Chiropractic, has been in private practice since 1994 after earning his B.S. in Biology and Doctorate of Chiropractic. He has experience as a ski instructor, collegiate pole-vaulter, working with professional soccer teams and in corporate health facilities. He lives with his wife Erin and their children in Westfield Massachusetts. 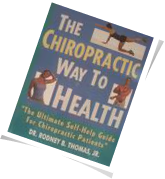 He is the author of The Chiropractic Way to Health, a 200 page self-help book. He speaks nation wide, teaching doctors on innovative detoxification and replenishing patient programs. He has been the president of the Pioneer Valley Chiropractic Society for over five years. A member of the Academy Of American Hospital Chiropractors.